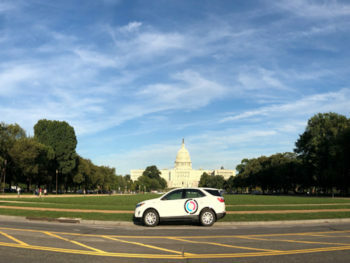 PSA’s Free2Move Carsharing service has launched in Washington, marking its debut in the US. The free-floating car sharing service provides 24/7 access to a fleet of 600 cars parked on public streets across all 8 wards in the District of Columbia. Members can join up via the Free2Move Carsharing app for a $10 membership fee and then use the app to locate, book, open/lock and pay for vehicles throughout the city. There are no late fees, “per trip” fees or insurance charges and every trip cost is based on a 500-mile usage. Parking and fuel – as well as insurance for above 21 years drivers– is included in the service (see video here). The service is one of the mobility solutions offered by Free2move in 12 countries and launches a year after the brand debuted the Free2move aggregator service in Seattle.